Throughout the month of November Mr. Orndorff's pre-kindergarten has taken the time to study the seasons and the changes they see through the seasons. A special study this year was a study about hibernation. Through the study the students were able to gather information from fiction and non-fiction text. The unit was used to help students understand that animals hibernate through the winter, but they need certain things when hibernating. The final assessment took place on the last day of the unit. Students were charged with creating a zoo for the animal of their choice. The student had to use prior knowledge and information gained to construct and build the habitat for the animal so they would have a successful hibernation throughout the winter months. 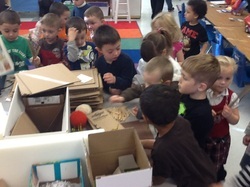 Students in Mrs. Hobbs kindergarten classroom explore different environments and what it takes to make plants grow. Through this process students understand the importance of soil, soil conservation, environment, and the needs of plants. Students developed a plan and tested their plan by creating environments for their seed. Students recorded what they saw in partner projects and noted the changes which needed to be made in order to get their seeds to grow. On Friday, April 26th Winter Street Elementary participated in a school wide STEM challenge. Students became researchers, engineers, and collaborative workers as they designed a package which would keep their egg safe during a vertical drop. The students collected materials throughout the week. The students then discussed, planned, built, and tested their design against their classmates. The students had a chance to drop and revise the product if they were not successful. Rentals Unlimited donated a personal lift which allowed the teachers to drop the student projects from 39 feet in the air.